The Shetland Sheepdog, or "Sheltie," is a sweet, loving, intensely loyal, active and busy dog who is eager to work and play with you. He is sensitive and affectionate, and seems able to read your moods, and he has a powerful desire to please you. He wants to be with you and to build your relationship. He is a gentle, kind and devoted family companion who can become very attached to one person. He can be reserved or suspicious around strangers, and generally does not like to be petted or touched by someone he doesn't know. He needs to gain experience with new people while he is still young, so that he doesn't grow up to be timid. He makes a good watchdog who will bark noisily at the approach of strangers, although he is likely to retreat in front of an intruder. He is known for barking too much, and can be yappy. He will need training to learn to stop barking when you tell him to. He is a very easy dog to train, quick to learn and eager to obey your commands. He responds excitedly and happily to praise and rewards, and wants above all to do as you wish. For this reason, he may be sensitive to harsh corrections, and so does better with gentle but firm training. He's a strong, quick, agile dog, and he always wants to busy! A high-energy companion, he needs a great deal of mental and well as physical stimulation. He loves to perform tasks, and excels at obedience, agility, and herding competitions. He has a strong desire to chase and herd, and will herd adults, children, and pets. He needs daily walks and chances to run free and play, but he must always be on a leash or in a safe area when he is outdoors, as he may try to herd just about anything, including cars. You must be careful not to let him off-leash near a roadway. He gets along well with other pets, and does well with considerate children. He may be too nervous and snappy around rambunctious, younger children, and must be taught not to nip at heels. He is best raised with children as a puppy rather than introduced to them as an adult. He is an extremely high shedder so he would be a good pet if you dislike vacuuming frequently. 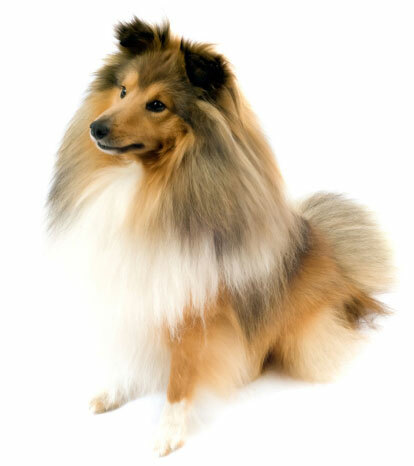 The Shetland Sheepdog is 13 to 16 inches tall (to shoulders) and weighs 12 to 18 pounds. He has a double coat consisting of a long, straight, rough outer coat and a soft, thick undercoat. His coat color is white and tan, or tri-colored and mixed with blue, black and sable. He only needs to be brushed occasionally but you might find yourself brushing him everyday to catch the dead hair before it comes out all over your home. The Shetland Sheepdog is named for the Shetland Islands off the coast of Scotland, and is probably descended from Rough Collies that were crossed with a smaller dog from Iceland. He was bred to herd cows and sheep as well as to be a wonderful family companion. He was first registered in England in 1909, then separated from collies and designated as his own breed in 1914. The first American "Sheltie" was registered in 1911, and the American Shetland Sheepdog Association was formed in 1929. An enormously popular dog, he has been the source of concern in recent years that his breed has fallen into the hands of too many "puppy mills," prompting warnings to owner to be very careful to acquire a well-bred, stable Sheltie. His AKC popularity was 20th out of 157 breeds in 2007.